April 11, 2019 -- An acute anterior cruciate ligament (ACL) injury often also inflicts damage to the anterolateral structures of the knee. A preoperative MRI can help to assess these injuries and assist in surgical planning, according to a study published in the April issue of the American Journal of Sports Medicine. A team of Italian researchers found that MRI was highly accurate for finding abnormalities of the anterolateral ligament (ALL) and capsule, correlating significantly with surgical results. On the downside, the modality wasn't quite as proficient at identifying abnormalities in the iliotibial (IT) band or determining whether ALL/capsular tears were partial or complete, according to the researchers led by Dr. Edoardo Monaco from the Sapienza University of Rome in Italy. "The most important finding of this study was that when surgical exploration was the gold standard, MRI evaluation demonstrated high sensitivity, specificity, and accuracy for detection of abnormalities of the ALL/capsule," the authors wrote. "The sensitivity and specificity for other parameters were not as high, such as whether there was a complete tear or not and anterior/posterior extension; for evaluation of the IT band, the values were low." In the majority of cases, an acute injury to the ACL also results in damage to the anterolateral structures of the knee. Although previous studies have reported on the rate of ALL injuries based on MRI scans, there is often broad variation in results, raising concern over the modality's reliability. More specifically, no prior research into MRI's efficacy for determining the extent of injury to anterolateral structures has been reported, according to the authors (Am J Sports Med, April 2019, Vol. 47:5, pp. 1186-1193). "The only studies that correlated MRI with anatomy were performed in cadavers with no anterolateral injuries reported," they noted. "Thus, the aim of this study was to evaluate the correlation between MRI findings and intraoperative anterolateral compartment exploration in acute ACL-injured knees." To test MRI's prowess, the researchers compared the modality with the gold standard of surgical exploration for detection of ALL and capsule injury and tears, as well as damage to the IT band, which is located in the thigh and acts like a muscle to stabilize the knee's movement as it flexes. The researchers enrolled 26 patients (mean age, 26.7 ± 7.1 years; range, 17-46 years) who came to the emergency room with a suspected knee injury. Potential subjects were excluded if they had a history of ipsilateral or contralateral knee injury, surgery, or an infection; had a multiligament injury; or could not complete an MRI scan. The 26 patients underwent a standard clinical knee exam, which included an evaluation of the ACL and a further inspection to exclude any concomitant injuries. After the assessment, the patients were referred for a 1.5-tesla MRI scan (Maestro Sonata, Siemens Healthineers) of the injured knee. The results were interpreted in a blinded manner by three readers: a musculoskeletal radiologist with 15 years of experience interpreting knee MRI scans, a musculoskeletal radiologist with eight years of experience, and an orthopedic surgeon with 10 years of experience. A preoperative MRI scan can be valuable in assessing damage to the anterolateral structures of the knee caused by an ACL injury. Image courtesy of Dr. Edoardo Monaco. After the MRI scan, all of the patients underwent ACL reconstruction within 10 days of their injury as part of the standard care for acute ACL ruptures at Sant'Andrea Hospital in Rome. At the time of the procedure, macroscopic injuries were identified, which allowed the researchers to determine correlations between MRI and surgical exploration findings. Abnormalities in the ALL and capsule were found on MRI in 22 (88%) of the 25 cases that were confirmed from surgery as abnormal. However, MRI was less effective for other diagnoses, such as detecting abnormalities in the IT band and determining whether ALL/capsule tears were partial or complete, and if the extension of the capsular tear was posterior or anterior. In other findings, the researchers reported that there was only a 53% agreement between MRI and the Ferretti grade of injury to the anterolateral structures. "This suggests that while the [Ferretti] classification is useful for description of surgical findings, the grade cannot be reliably established from MRI, at least with the parameters used in the current study," the authors wrote. "The main reasons for this lack of correlation are that the percentage agreement between MRI and surgery for the parameters of complete/partial injury and anterior/posterior extension were only 61% and 57%, respectively." Although MRI may not be a completely exemplary modality for assessing damage to anterolateral structures, the researchers maintained that it can still be helpful in preparing surgeons for procedures. 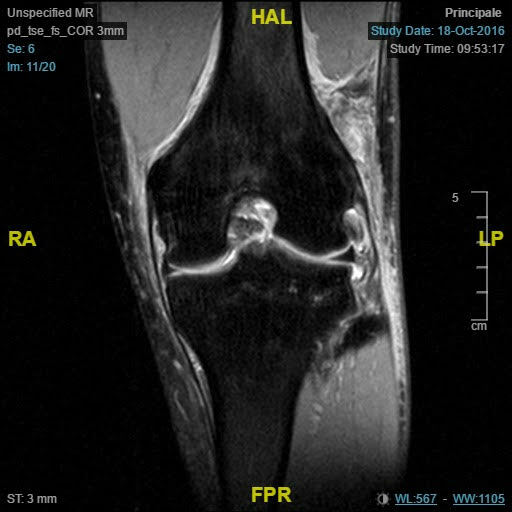 "MRI could allow the surgeon to find anterolateral ligament lesions in acute cases in order to better plan surgical technique for each patients, including anterolateral ligament repair or reconstruction," Monaco wrote in an email to AuntMinnie.com.